There must be something about Ephesians. I'm convinced that whenever God wants to tell me something, He sends me the message several times just so I won't overlook or miss it. This is the second bible study on Ephesians I've had the privilege to review, and ya'll this one is sooooo good. 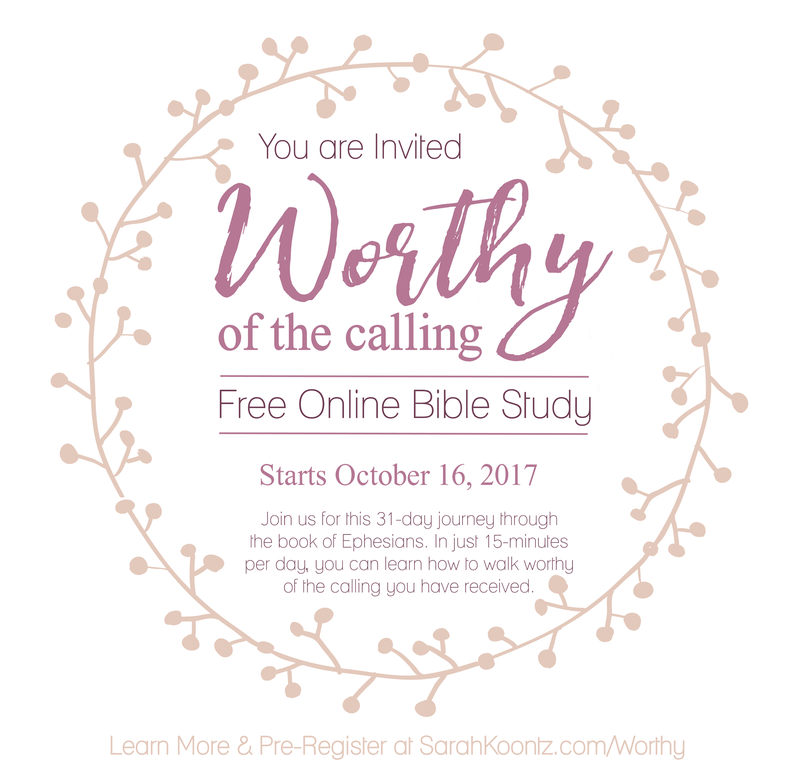 I was fortunate enough to be a part of the Worthy of the Calling launch team - to get the word out about this wonderful study that is available to everyone beginning tomorrow, October 16th! Pre-register here to claim your spot on this journey, you will be glad you did. P.S. Did I mention the giveaways and freebies? Who doesn't love those? Sarah's writing feels akin to sitting down on the front porch swing with your best friend from next door with a cool, glistening glass of lemonade (or sweet tea for my GRITS lol). It is so easy and relaxed, that all the anxiety one might feel about undertaking a bible study easily dissipates as she shares the word of God with such familiarity and confidence. There is such a practicality in these daily readings, and the best part of all, they can be read or accessed anywhere because the bible study is completely online. As I read, I found myself immersed in the personal aspect of Ephesians. Often, it's tempting to feel disconnected from the bible and view it as God's word for another time, group, or person. But Sarah's ability to make the reader feel an individual connection to the passages and contextual nuances of Paul's writings makes this so special and transformative. I felt specifically called and worthy of that calling because of this study. I thoroughly enjoyed taking this journey through Ephesians. If you've ever doubted your calling or have been unsure of who you are and why you are here, this is the study for you. I'll be honest with you, I've doubted myself more than a few times. I don't lack confidence, per se. But let me tell you, there's a difference between knowing that you are God's and believing it. Until that thing takes root in your heart and mind, your identity will always be flaky and shifty. This study is a refreshing and honest look at who we are in Christ, and who we are called to be in Him. Connected. Loved. Cared for. Worthy. All you need to enjoy Worthy of the Calling is 15 minutes, your favorite mobile device, and a heart ready to receive.